SALT LAKE CITY — Interior Secretary Ryan Zinke and outdoor retail giant Patagonia traded harsh words over the Trump administration's plans to shrink several national monuments, an opening salvo in an imminent legal battle that could be waged for years. A barrage of lawsuits is expected by groups looking to block President Donald Trump's order on Monday drastically reducing Utah's Bears Ears and Grand Staircase-Escalante National Monuments. Three lawsuits had been filed by Tuesday night, with more expected Wednesday. Trump said he was reversing federal overreach by drastically cutting the sprawling monuments named by Democratic presidents. But tribal leaders, environmentalists and others argue the president doesn't have that authority and his move jeopardizes a wealth of Native American artifacts, dinosaur fossils and rugged spaces. Patagonia, which is expected to file a lawsuit by Wednesday, replaced its usual home page with a stark message, "The President Stole Your Land. "The California-based company called Trump's actions illegal and described Monday's action as the largest elimination of protected land in American history. Zinke shot back, calling that "nefarious, false and a lie." He told reporters that the land targeted by Trump remains protected because it is still under federal control. "I understand fundraising for these special interest groups," Zinke said. "I think it's shameful and appalling that they would blatantly lie in order to gain money in their coffers." Zinke took a defiant tone in a conference call with reporters, saying, "I don't yield to pressure, only higher principle. And sound public policy is not based on threats of lawsuits, it's doing what's right." Patagonia has "always viewed public lands as our special interest," said company spokeswoman Corley Kenna. "And it's odd that Ryan Zinke has no problem with special interests when they're paying for his private jets. We have been fighting for these lands for decades, so that hunters, fishers, hikers and everyone else can use them and help us protect them." Patagonia's statements follow more than a year of the company's activism on the issue, which is not the only time the retailer has stepped in a debate over Utah's public lands. The company joined with REI and other outdoor recreation companies in leading a push to move the industry's lucrative trade show from Salt Lake City to Denver after two decades in Utah. The move was a high-profile protest over Utah leaders' insistence on getting the Bears Ears designation rescinded and trying to take more control of federal lands. Zinke argued that Bears Ears is still larger than Zion and Bryce Canyon national parks combined even after being downsized to about 202,000 acres while Grand Staircase-Escalante retains about 1 million acres. Environmental and conservation groups and a coalition of tribes filed lawsuits Monday that ensure Trump's announcement is far from the final word in the yearslong battle over public lands in Utah and other Western states. The court cases are likely to drag on for years. A coalition of the Hopi, Ute Indian, Ute Mountain Ute, Zuni tribes and Navajo Nation sued late Monday to challenge the Bears Ears reduction, which cuts monument status for the rugged land in southeastern Utah by about 85 percent. Bears Ears features thousands of Native American artifacts, including ancient cliff dwellings and petroglyphs. The tribes argue that federal law only gives presidents the ability to create a national monument, not the ability to downsize one. 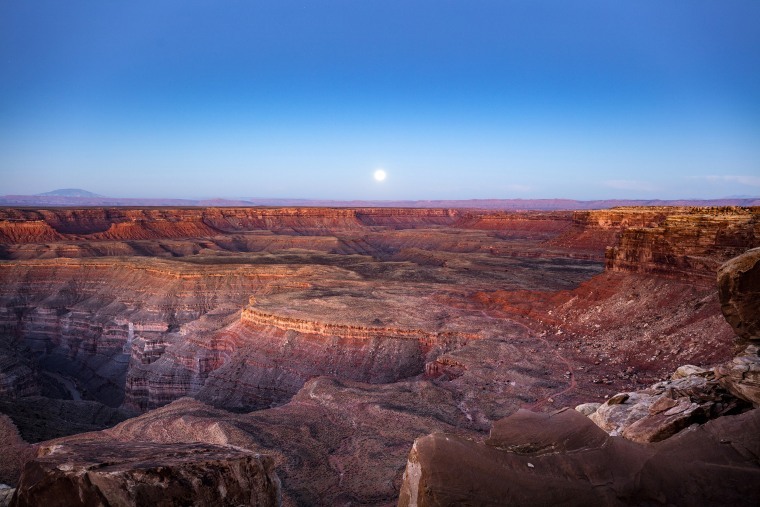 Two lawsuits also have been filed to try to block the Grand Staircase decision, which cuts the monument nearly in half. Grand Staircase contains scenic cliffs, canyons, waterfalls and arches — and one of the nation's largest known coal reserves. The two monuments were created by Democrats Barack Obama and Bill Clinton under a century-old law that allows presidents to protect sites considered historically, geographically or culturally important. Trump acted on a recommendation by Zinke, who also has urged that two other large national monuments in the West be reduced in size, potentially opening up thousands of acres of land revered for natural beauty and historical significance to mining, logging and other development. The interior secretary's plan would scale back Nevada's Gold Butte and Oregon's Cascade-Siskiyou, in addition to the two Utah sites. Zinke said Tuesday he would focus changes in Gold Butte on the site's water districts. Gold Butte protects nearly 300,000 acres of desert landscapes featuring rock art, sandstone towers and wildlife habitat for the threatened Mojave Desert tortoise and other species. Zinke declined to specify how many acres he wants to remove from monument status, stressing that the administration is working with Nevada's governor and congressional delegation to find a solution.